Do you remember the film Julie & Julia? I've seen it in the cinema and I absolutely loved it. It was funny, the food seemed to be tasty and the actresses were good looking. So what about it? It was the first time I heard something about Julia Child. When I went to google today, a doodle remind me about her. Today is the 100th birthday of Julia Child (Check it here on WIKIPEDIA), the co-author of the book Mastering the Art of French Cooking Check it here on WIKIPEDIA and of the book My Life in France. Child tried to balance the recipes between the traditional French haute cuisine and the possibilities of an American hobby cook. Everyone could find something for himself. It's important to mention the influence of Julia Child on the American cuisine and culture - she had a cooking show in TV as well. Also Julia Child was one of the great people who brought wine back to the [American] kitchen. Cooking with wine is a fine thing. It's possible to bring the taste and the aroma of dishes out. Don't worry, the alcohol boils out nearly to 100%. Nearly, so that's the reason why I wouldn't serve dishes where I put alcohol to children or people who have/had a problem with it. On the other hand, you don't have to put a lot, just a shot and that's nothing you have to be worried about. 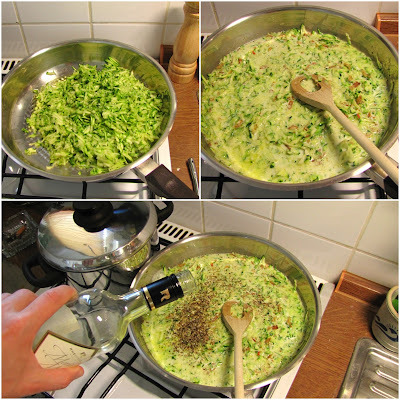 As you may see in my older posts I am a great ambassador of using white wine in the cuisine. I was tired of working on my thesis and hungry because of that mental stress you get after hours working on the notebook - I jumped to the kitchen and made a ragoût. Since zucchinis are a great deal in the French cuisine and wine is used for cooking purpose, it was my contribution to honour Julia Child. I grated the zucchinis, put them on some butter and covered with milk. I added pepper, herbs, onions and a shot of white wine. I stewed it until the milk was already gone (about 10 minutes) and finally and the very end, add 3 tablespoons of yogurt to get the creamy consistence of a sauce. After adding the yogurt, don't cook it anymore. Otherwise the yogurt changes to proteins and water. I enjoyed the ragoût with some pasta. In the evening I'll eat it cold with some bread. It was a very fast but healthy meal. 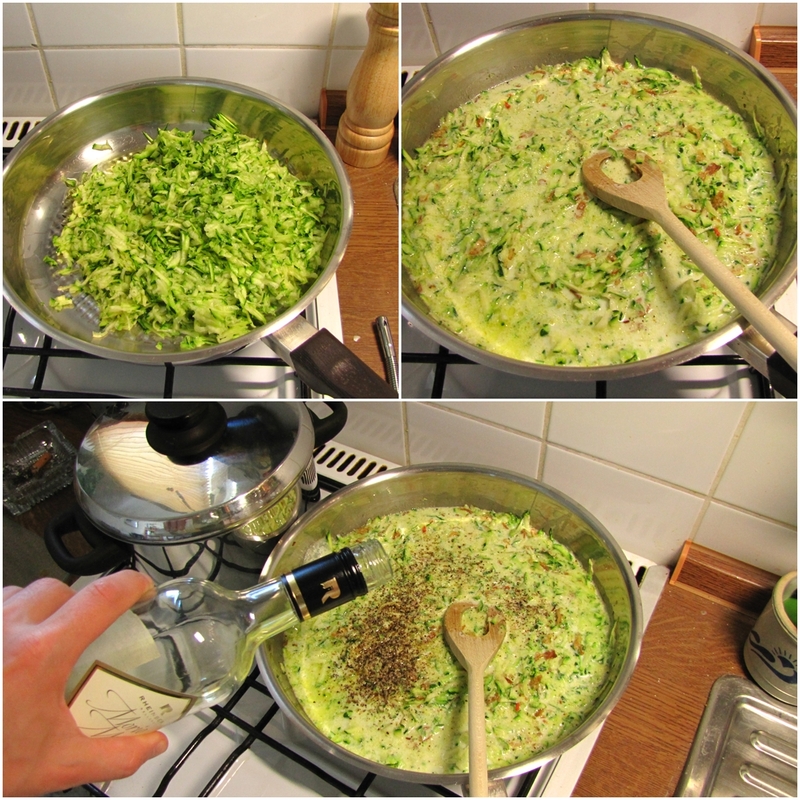 It takes about 20 minutes to prepare it. 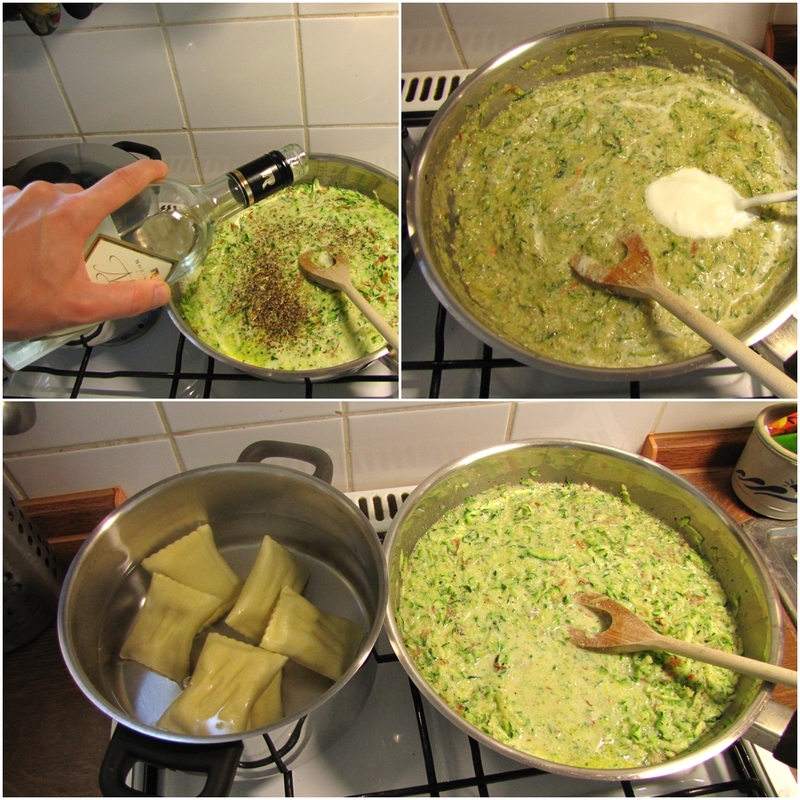 The half of the time is needed for grating the zucchinis and in the meanwhile the sauce was cooking, I cooked the pasta. "... thinking back on it now reminds that the pleasures of the table, and of life, are infinite – toujours bon appétit!" - Julia Child, in: My Life in France.